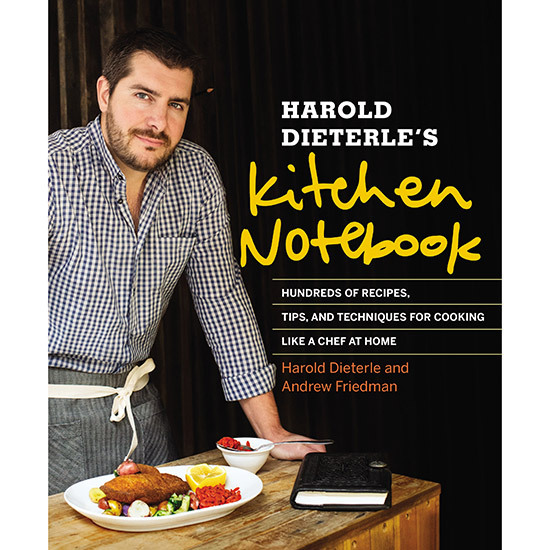 In his new book Harold Dieterle's Kitchen Notebook, which comes out today, the Top Chef: Season 1 champion offers smart ideas for how to use each ingredient to its full potential. Here, four fantastic variations on cauliflower. Chef Harold Dieterle knows how difficult it can be to break out of a culinary rut. "Cooks are constantly asking me how they can expand their repertoire and cook different things," says the Top Chef: Season 1 champion and chef of Perilla and Kin Shop in New York City. In his new book Harold Dieterle's Kitchen Notebook, which comes out today, he offers smart ideas for how to use each ingredient to its full potential. Each "notebook" page features a handful of additional uses for one of the ingredients in the base recipe. "When you go to the supermarket to purchase the ingredients for a recipe," he says, "you always have leftovers. You need a teaspon of a fresh ingredient, but you bought a pound of it. And that's a great chance to broaden the range of what you can cook." He offers four smart, easy variations for cauliflower, which appear in the recipe for pan-roasted sardines. 1. Cauliflower-spinach purée: Purée sautéed cauliflower and sauteed spinach together for a super-silky side dish. 2. Fried cauliflower: Bread cauliflower with bread crumbs or tempura batter, fry and toss with spicy tomato sauce as an appetizer. 3. Savory cauliflower panna cotta: Simmer 3 cups heavy cream and 2 cups cauliflower florets in a small pot until the florets are tender, about 15 minutes. Blend in a blender, then strain into a medium stainless steel bowl. Chill over a larger bowl filled halfway with ice water. While chilling, add 1 1/2 teaspoons powdered gelatin and whisk for 3 minutes. Once fully chilled, about 10 minutes more, pour into 4 ramekins or soufflé cups. Cover with plastic wrap and refrigerate until set, about 4 hours. 4. Mashed cauliflower: Cook cauliflower for about 30 minutes in a wide, heavy saucepan over low heat, until dark brown and caramelized. Transfer to a mixing bowl, add 1 tablespoon extra virgin olive oil and mash with a potato masher. Season with salt and pepper. Adapted from the book HAROLD DIETERLE’S KITCHEN NOTEBOOK by Harold Dieterle and Andrew Friedman. © 2014 by Harold Dieterle and Andrew Friedman. Reprinted by permission of Grand Central Life & Style. All rights reserved.